The beauty of blind tastings is that rank outsiders are in with a chance. The category for this year’s Diners Club Winemaker of the Year award was Pinotage and it was somewhat surprising when Christian Groenewald won for his Eagle’s Cliff 2017 ahead of Abrie Beeslaar of Kanonkop or Beyers Truter of Beyerskloof or Pierre Wahl of Rijk’s or just about anybody else. Admittedly, this is the second time that Groenewald has received this accolade, his Arendskloof Shiraz Tannat 2011 doing the business in 2011 (see here). Groenewald farms between Worcester and Villiersdorp, some 90ha under vineyard out of a total of 600ha (see images here). The family have been on this property since the mid-1970s after their original land was expropriated in order to expand Brandvlei dam. For many years, they supplied Brandvlei Cellar but in 2005, Groenewald, who has a degree in agriculture plus an MBA, built his own cellar and founded Arendskloof and Eagle’s Cliff among other brands. So what is the Eagle’s Cliff 2017 like? Unwooded, the nose shows some floral perfume before red cherry plus a little earth and spice while pure fruit, bright acidity and lightly grippy tannins characterize the palate. I’m not sure this is absolutely the best Pinotage in the country but it’s without artifice and utterly charming. Total production: 13 000 bottles. Price: R60 a bottle. Can you confirm exactly which wine actually won? 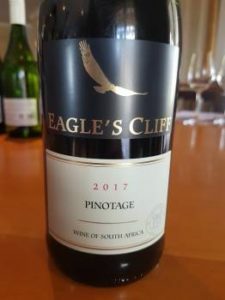 According to Diners Club website it was the more expensive Eagles Cliff Arendskloof Pinotage 2017 (R147) that was the winner. However, Eagle Cliff website says the Arendskloof Pinotage has 48 months in the barrel, which I can’t see how a 2017 vintage could have undergone. So I don’t know now if it’s the vintage or the brand name that’s wrong on Diner’s website, or Arendskloof 2017 had (much) less oak aging. I’ve not tasted either, but it may explain your surprise if it wasn’t the unoaked Eagles Cliff that won…. Hi Peter, It was miost definitely the unwooded Eagle’s Cliff Pinotage 2017 which won. The Arendskloof 2015 as made by Groenewald was also a finalist, 50% of this wine undergoing maturation in barrel, 25% new – it has a cellar door price R350 a bottle. Thanks Christian for the clarification. I have updated my website.